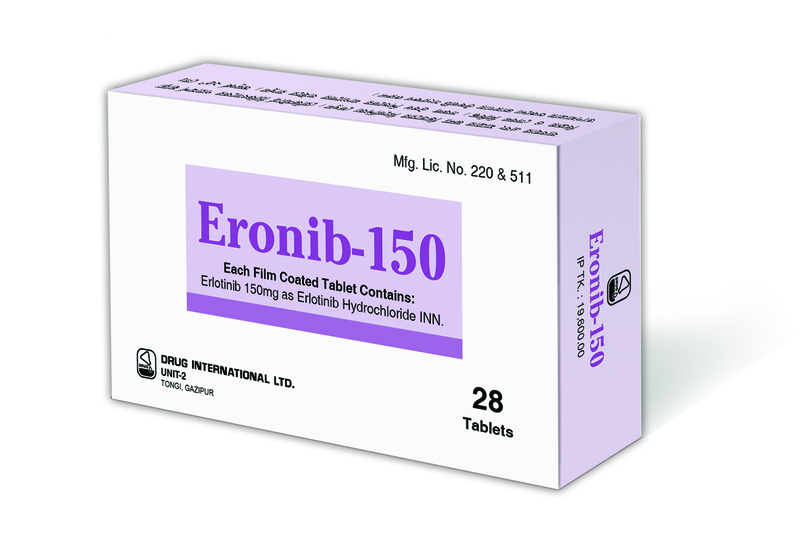 Composition:Eronib-150 Each ﬁlm coated tablet contains Erlotinib 150 mg as Erlotinib HCl INN. Indications: Non-Small Cell Lung Cancer (NSCLC): It is indicated for the treatment of patients with metastatic non-small cell lung cancer (NSCLC) whose tumors have epidermal growth factor receptor (EGFR) exon 19 deletions or exon 21 (L858R) substitution mutations as detected by an FDA-approved test receiving ﬁrst-line, maintenance, or second or greater line treatment after progression following at least one prior chemotherapy regimen. Pancreatic Cancer: Erlotinib in combination with Gemcitabine is indicated for the ﬁrst-line treatment of patients with locally advanced, unresectable or metastatic pancreatic cancer. Dosage and Administration: Recommended Dose – NSCLC: The recommended daily dose of Eronib for NSCLC is 150 mg taken on an empty stomach, i.e., at least one hour before or two hours after the ingestion of food. Treatment should be continued until disease progression or unacceptable toxicity occurs. Recommended Dose - Pancreatic Cancer: The recommended daily dose of Eronib for pancreatic cancer is 100 mg taken once daily in combination with Gemcitabine. Eronib should be taken on an empty stomach, i.e., at least one hour before or two hours after the ingestion of food. Treatment should be continued until disease progression or unacceptable toxicity occurs. Or, as directed by the registered physicians. Use in pregnancy and lactation: Pregnancy category D. Eronib can cause fetal harm when administered to a pregnant woman. If it is used during pregnancy, or if the patient becomes pregnant while taking this drug, the patient should be apprised of the potential hazard to the fetus. Lactation: There is no information regarding the presence of Erlotinib or its metabolites in human milk, the effects on the breastfed infant, or the effects on milk production. Women should be advised not to breastfeed during treatment with Eronib and for 2 weeks after the ﬁnal dose. Females and Males of Reproductive Potential: Contraception: Females: Eronib can cause fetal harm when administered to a pregnant woman.Females of reproductive potential should be advised to use effective contraception during treatment with Eronib and for one month after the last dose of it. Patients should be counseled on pregnancy planning and prevention. * Females of reproductive potential should be advised to use highly effective contraception during treatment with Eronib, and for at least 2 weeks after the last dose of Eronib. *Patients should be advised to contact their healthcare provider if they become pregnant, or if pregnancy is suspected, during treatment with Eronib. *Breast-feeding mothers should be advised to discontinue nursing while receiving Eronib. Patients should be advised to stop smoking and the dose of Eronib may need to be adjusted if they smoke. Pediatric Use: The safety and effectiveness of Eronib in pediatric patients have not been established. Hepatic Impairment: Hepatic failure and hepatorenal syndrome, including fatal cases, can occur with Eronib treatment in patients with normal hepatic function; the risk of hepatic toxicity is increased in patients with baseline hepatic impairment. Patients with hepatic impairment should be monitored (total bilirubin greater than upper limit of normal (ULN) or Child-Pugh A, B and C) during therapy with Eronib. Treatment with Eronib should be used with increased monitoring in patients with total bilirubin greater than 3 x ULN. Packing: Eronib-150:Each box contains 2x14’s tablets in Alu- Alu blister pack.